In similar fashion to Game’s 1 and 2 the Canucks would get one goal late to get a win in a low-scoring game. Max Lapierre was the hero for the Canucks, scoring on a behind-the-net rebound past an out of position Tim Thomas in the 1-0 win. Roberto Luongo made 31 saves for his second shutout of the series, Tim Thomas would make 24 saves but made a single mistake that bit the Bruins. Both teams were held scoreless on the power-play but the Bruins were outhit and beat on the dot. 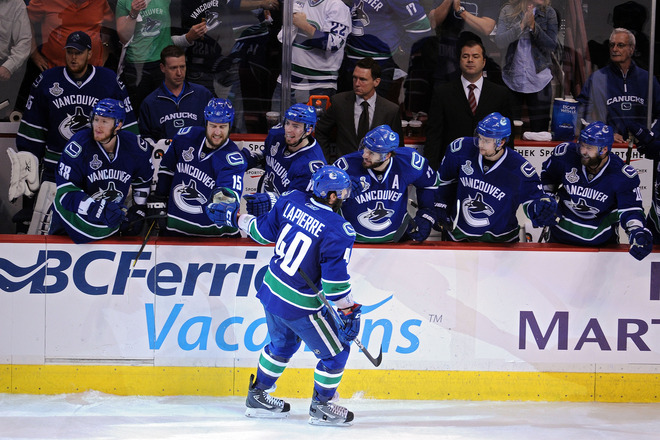 The Canucks dictated the matchups well but the grinding line made the difference with the goal. After an energetic start to the game for the Canucks Raffi Torres would take a penalty just 1:39 into the game when he was sent off for tripping. The Canucks would kill off the penalty with an aggressive defensive system, the Bruins had a good chance down low late but couldn’t connect. Chris Kelly would lead out a 2-on-1 and rang the pipe with a hard shot that beat Roberto Luongo clean but not the goal frame. The Canucks would find a lot of open ice thanks to the last change, matching up favorably. The Bruins would avoid giving up the first goal on a huge blocker save by Tim Thomas on Mason Raymond going left-to-right. Once again the Canucks would stop their own momentum when Henrik Sedin was sent off for hitting from behind. The Bruins would set up a bit more in the first minute but couldn’t get much pressure on Luongo and the Canucks killed off the penalty fairly easily. The game would even out in terms of chances and possession but the speed of the game and north-south nature favored the Canucks brand of play. For the third time the Bruins would stop the momentum by getting a power-play, this time when Andrew Alberts was sent off. Once again the Canucks would kill it off as the Bruins used grinders to try to spark the power-play, it didn’t work at all. Towards the end of the period Milan Lucic and Alex Burrows would both get sent off, creating a 4-on-4 after a pre-whistle battle resulting in coincidental minors, Burrows for diving and Lucic for tripping. The 4-on-4 would expire to open the second period and the Canucks would once again look like dominant team 5-on-5 early in the second period. The Bruins would get a fourth power-play early on in the second period when Ryan Kesler was called for interference on Thomas. This too went by the boards as the Bruins got set up but couldn’t threaten Luongo, instead shooting high shots that were easily snared. The Canucks would get their first power-play when Adam McQuaid was called for taking down Chris Higgins on a 1-on-1. The Bruins would kill it off with great board play, keeping the Sedin’s at bay and following up with a monster shift in the Canucks zone. Tanner Glass had a Grade A opportunity to break the scoreless tie with Thomas out of position but whiffed on the bid and Thomas eventually covered. The Canucks would get a power-play late in the period with a long shift in the Bruins zone that ended with Patrice Bergeron was sent off after battling on the backcheck. The Bruins would kill off the penalty, stymying the Canucks momentum with the late kill. The teams would skate off the next minute or two without a goal and the game would go to the second intermission in a scoreless tie. After a back-and-forth start to the third period Max Lapierre would open the scoring, catching Tim Thomas out of position on a shot that went behind him, hit the boards and came out the other side. Lapierre was camped out at the other side of the net and put it past Thomas before he could get back into the net. The Canucks continued to play aggressively through the middle of the period and the Bruins looked uncomfortable when trying to bring the puck up ice. Many of the Bruins rushes were started by dump-in’s but the Canucks speed let them get to the puck first. Rich Peverley was sent off with under eight minutes left for tripping along the boards. The Bruins killed the penalty off but were only left with 5:30 left to tie the game up. The Canucks would play along the boards, knowing where the Bruins like to pass it upon entry and would keep the Bruins at bay during some critical moments. With just around a minute left the Bruins would pull their goalie. The Bruins would get a faceoff with 42 seconds left but couldn’t make anything of the extra man and the game would go by the wayside. The Canucks would win on a lone third period goal to take a 3-2 series lead.